What surfer wouldn't dream of having a work office like this? A thatched tiki hut beneath the tropical palms, overlooking the perfect sets as they roll in throughout the day. This is a nine-to-five I could get used to real quick! is an original framed 6x12 palette knife oil painting. 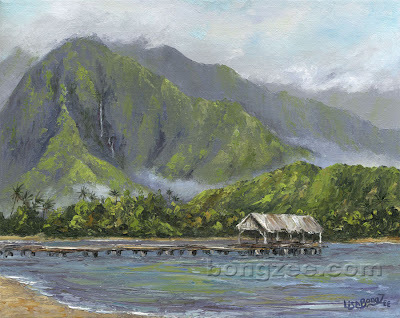 "Misty-cal Morning At Hanalei Bay". The inspiration for this painting was a recent (wonderful) vacation I took to the island of Kauai. Early one morning, I stopped at Hanalei Bay, on the north side of the island. The day was just waking up and the morning mist was slowly disappearing. The overcast sky was clearing, ready to start another perfect day in Paradise. It was truly Misty-cal ! I was quite pleased with how this piece turned out. A pair of palms against a dramatic evening sky, whose colors dance along the surface of the tropical sea. is an original framed 8x10 palette knife oil painting. 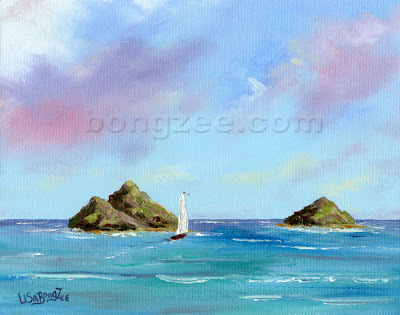 Spend a perfectly enchanting Hawaiian evening sailing out to the beautiful Mokulua Islands located off of Lanikai Beach in Kailua, Hawaii, and you may never want to go back home!